City wall. Xi'an. Tours to China. Travel to China. China. Legend tour. At the time when Zhu Yuanzhang captured Huizhou, long before the establishment of the Ming Dynasty, he was admonished by a hermit named Zhu Sheng, who told him to "built high walls, store abundant provisions and take your time in proclaiming yourself emperor", advice which Zhu Yuanzhang heeded. Once the whole country was unified, he sent orders to the local governments to build city walls on a large scale. Zhu assumed that "out of all the mountains and rivers in the world, the central Qin is the most strongly fortified and strategically impregnable." 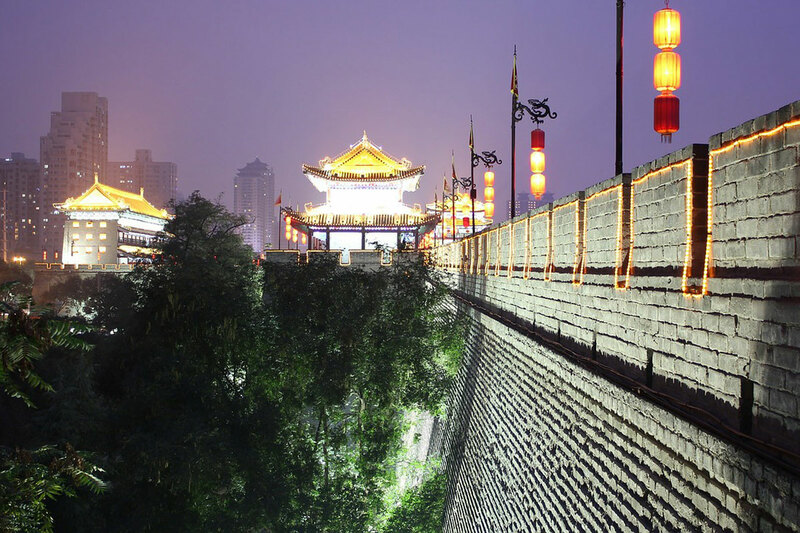 The city wall of Xi'an is an extension of the old Tang Dynasty structure, as a result of this wall building campaign. 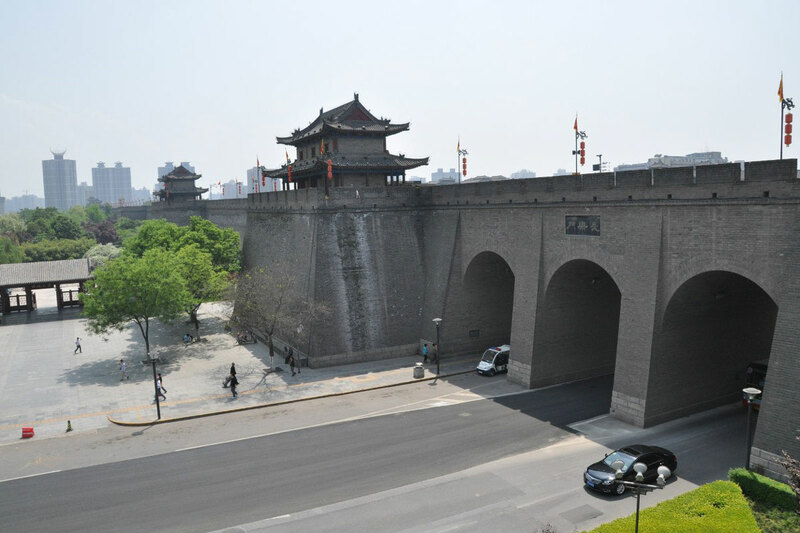 Xi'an's city wall after its enlargement in the Ming Dynasty stands 12 meters high. It is 12-14 meters across the top, 15-18 meters thick at bottom and 13.7 kilometers in length. There is a rampart every 120 meters. The ramparts are towers that extend out from the main wall, the top of the rampart being at the same level as the top of the wall. The ramparts were built to allow soldiers to see enemies who would try to climb the wall. The distance between two ramparts is just within the range of arrow shot from either side. This allowed soldiers to protect the entire wall without exposing themselves to the enemy. There are altogether 98 of them on the wall; each has a sentry building on top of it. The weapons in ancient times were primitive. The gates of the city wall were the only way to go into and out of town. Therefore, these gates were important, strategic points, that the feudal rulers racked their brains to try to defend. 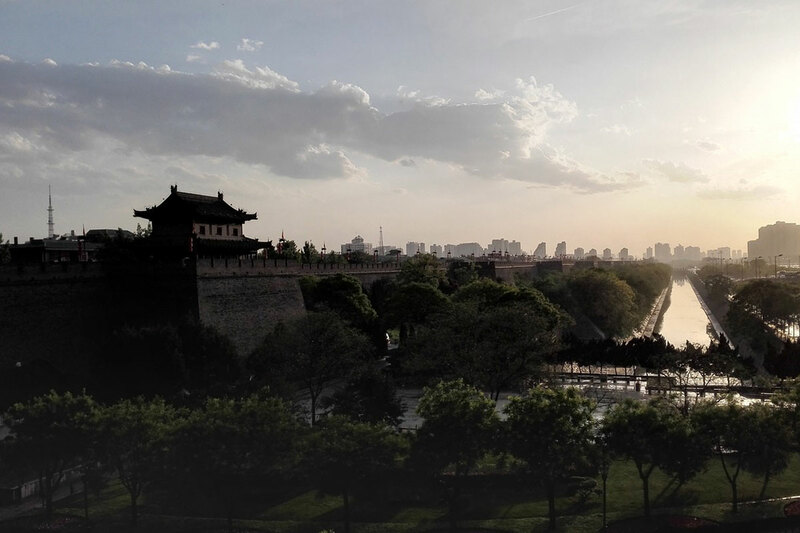 In Xi'an's case, the east, west, south and north gates, each consists of three gate towers. The main tower is called Zhenglou. Zhalou is the gate tower with the suspense bridge, and Jianlou is the narrow tower. The Zhalou tower stands away from the wall. It is used to lift and lower the suspense bridge. The Jianlou tower is in the center of the others. Its front and the two outer sides have square windows to shoot arrows from. The Zhenglou tower is the inner one. It is the main entrance to the city. Jianlou and Zhenglou are connected by tunnels, called Wengcheng in which soldiers could be stationed. From the Wengcheng there are also horse passages leading to the top of the wall. There are gradually ascending steps made so that it is easy for war horses to ascend and descend. There are all together 11 horse passages around the city. A watch tower is located on each of the four corners of the wall. The one at the southwestern corner is round, probably after the model of the imperial city wall of the Tang Dynasty, but the other three are square-shaped. On top of the watch towers there is a corner rampart, higher and larger than the ordinary ramparts. This shows the strategic importance of the corners of the city wall in war times. Along the outer crest of the city wall there was constructed crenellations or battlements, 5,984 of them. Under each crenel there is a square hole, from which arrows wee shot and watch was kept. The lower, inner walls are called parapets. They were used on the inside of the wall to prevent soldiers from falling off the wall when traveling back and forth on top of the wall. 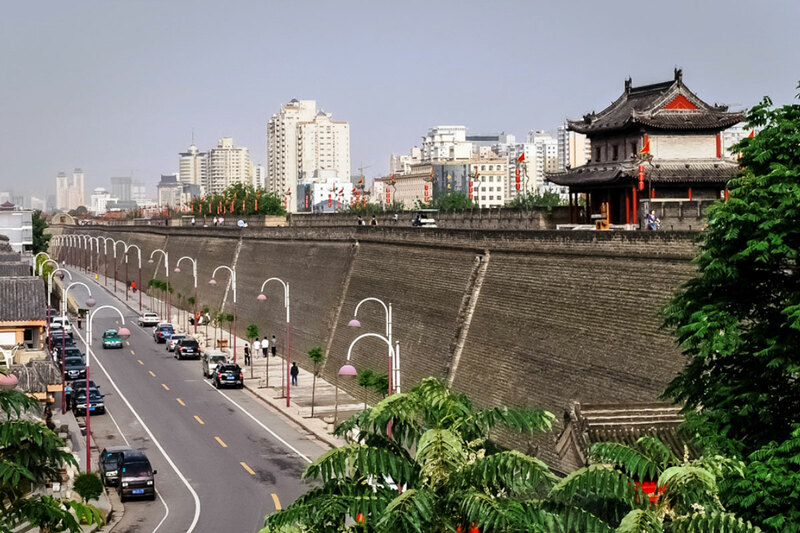 The first city wall of Xi'an was built of earth, rammed layer upon layer. The base layer was made of earth, quick lime, and glutinous rice extract, tempered together. It made the wall extremely strong and firm. Later, the wall was totally enclosed with bricks. On top of the wall, there is a brick water trough every 40-60 meters. They are used for drainage. They have played a very important role in the long-term protection of the city wall of Xi'an. A moat, wide and deep, runs around the city. Over the moat, there used to be a huge suspense bridge which would cut off the way in and out of the city, once lifted. Mausoleum of the First Emperor of the Qin Dynasty (221 B.C. - 206 B.C.) and Museum of Qin Terra-Cotta Warriors and Horses Heritage is our legacy from the past, what we live with today, and what we pass onto future generations. Tours № C002. Beijing – Xi’An - Beiing (8 days/7 nights). Tours № C004. Beijing – Xi'An - Kong Gong (10 days/9 nights). Photo. Xi'an. Ancient City Wall.